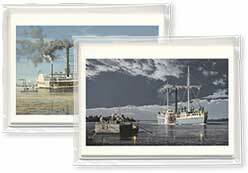 A series of works by artist Gary R. Lucy; each painting has been reproduced on 5" x 7" notecards depicting a small portion of history devoted to America's Inland Waterways. The image appears on the front of the card with an historical essay printed on the back. 4 1/4" x 6" card with brief essay on back. 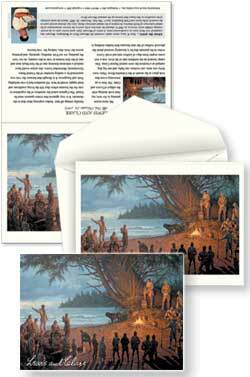 LEWIS & CLARK NOTECARDS 5" x 7" card with envelope, blank inside and historical essay on back. 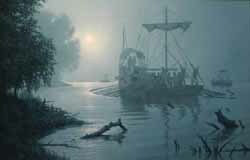 Wood River, St.Charles,Eagle Creek, Foggy Morning, Tavern Creek, The Vote, Pirogues Traversing. 6" x 4 1/4" card with a brief essay on back. 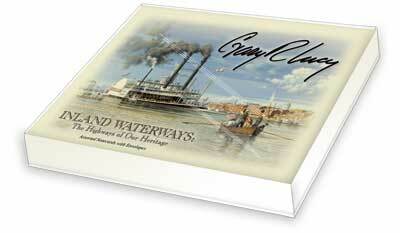 Wood River, St. Charles, Eagle Creek, The Vote.